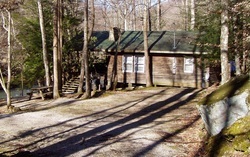 Cozy 2-bedroom cabin in a beautiful rural setting, on the banks of the Holly River. Includes TV w/satellite, VCR, fireplace, electric heat & A/C and fully equipped kitchen. Can be rented on a daily or weekly basis. Sleeps 7.